Just when you thought you were finished, they pull you right back in again! Actually I was never really finished, once I had the drawer frames glued up I still had a little more work to do on them before we’re ready to assemble the entire body of the dresser. So in today’s episode we’re going to finish the construction of the drawer frames. This involves cleaning up the dried glue and tweaking the joinery to insure the drawers will slide in and out smoothly every time. And it also involves cutting a dado down the center rails to accept a drawer guide we’ll install later to help keep the drawers perfectly centered. Unlike the dados we cut for the sides of the dresser body, these dados are a stopped version. So this requires a little more planning to make sure they don’t show on the front face and a little chopping with chisels, followed by some tweaking with a router plane. All of it can sound a little complicated, but it’s not as bad as you think it will be. Looks good, Matt! This is really making me want to build one for my daughter as well. Half the drawers from her current garage sale dresser are stacked on top as the hardware pulled out of the particle board. Matt, I have been woodworking for over 35 years and I don’t often comment on videos and certainly do not consider myself the safety police but, you are demonstrating some very dangerous techniques in this video. First, dropping a piece of wood onto a rotating cutterhead is a recipe for a kickback disaster as you only have one control surface and relying on your body (hands and fingers) for the second. Second, I realize you have a Sawstop but your technique at the 13:30 mark with your hand running directly over the dado stack gave me the willies. 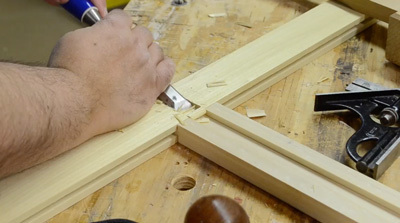 I have a friend who lost all 4 fingers on his right hand doing this over a molding head mounted on a table saw. Never rely on your work piece as a safety barrier. Ironically, this would have been an excellent opportunity to demonstrate one of your sponsors safety devices. I do appreciate the overall quality of your videos. You’re absolutely correct, if handled without caution, this frame could be thrown back very easily. I could have just flipped the frame around and plowed into it from the other side or have just plowed straight through and accepted a thru dado in it’s place. These are both very acceptable options. I still feel confident in the way I approached it, and stand by my decision to go that route, and have had success with this technique frequently. But I also should emphasize it’s not one that should be taken for granted or without being aware of the potential danger of kickback as you mentioned. You’ll have to forgive me, but I’m reading between the lines slightly when you imply to the fact that I have a SawStop, as if that somehow gives me license to be more cavalier with my safety. It wouldn’t be the first time that gets implied to anyone with a SawStop, but that’s far from the truth CHORTLE! Thanks for watching, and whether I like it or not, thanks for watching out for safety in the shop. I never intended to imply having a Sawstop meant people were cavalier toward safety. To the contrary, the fact that you have a Sawstop indicates that safety is important to you.